I made my semi-annual visit to downtown bars the other night and found myself looking at Anodyne's bottle selection for something interesting, as the draft selection rarely changes and what is on tap is hardly exciting. 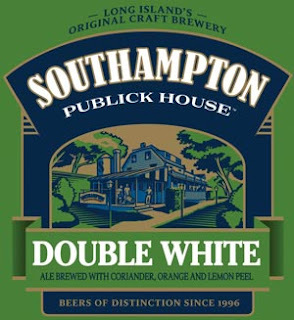 I was surprised to see bottles of Double White from Southampton Publick House, a New York brewery that is probably best known for popularizing the "Imperial Witbier" style (is that even an official style?). Fans of Marble's Double White should be on the lookout for this GABF Silver medal winning beer, as it was an inspiration for Ted Rice to brew his own version of the style. Do a side by side comparison of the two beers; compare and contrast, if you will. Use in place of champagne for that morning Mimosa. I haven't noticed it sold anywhere but Anodyne, but I also haven't been to any stores since my downtown excursion, so it may be in stores right now. Anyway, you're probably getting growlers filled today and not worrying about bottled beers, but thought you should know anyway. Enjoy your holiday!